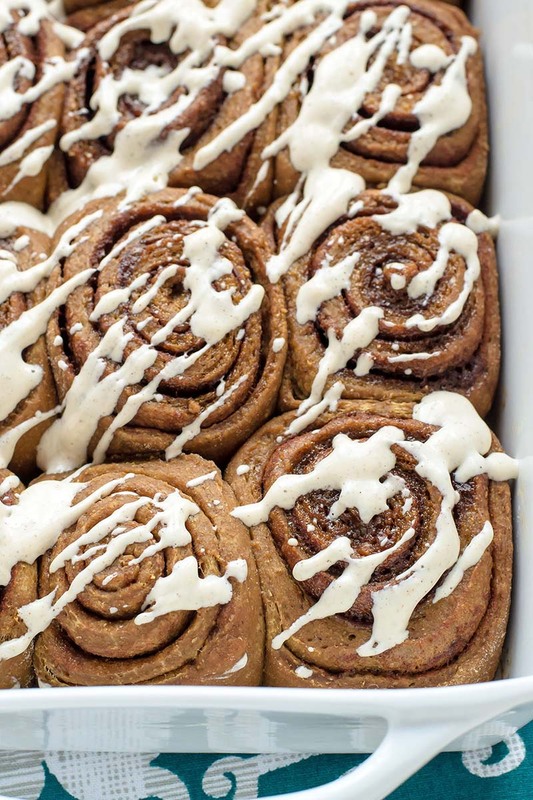 Homemade cinnamon rolls with the flavor of gingerbread cookies smothered in cinnamon cream cheese frosting. Recipe can also be made as overnight cinnamon rolls. Prepare the dough: Pour milk into a large glass measuring cup. Add butter and microwave on high, until the mixture is warmed to 120-130°F. The butter may not melt completely and the milk should feel warm but not hot. Place the white whole wheat flour, brown sugar, egg, molasses, vanilla, yeast, salt, cinnamon, ginger, cloves, and nutmeg in the bowl of a standing mixer or a large mixing bowl. Pour in the heated milk and butter. Beat on low speed for 3 minutes, stopping occasionally to scrape down sides of bowl. Add 2½ cups all-purpose flour. Beat on low speed, until the flour is absorbed and the dough is no longer sticky, scraping down sides of bowl as you go. If dough is extremely sticky, add remaining ½ cup flour one tablespoon at a time, combining after each, just until dough begins to form a shaggy ball and pulls away from sides of bowl. It should still feel fairly tacky. If using a stand mixer, fit the mixer with a dough hook and knead on medium low for 6 minutes, until smooth and elastic. If kneading by hand, turn the dough out onto a floured work surface and knead until smooth and elastic, about 8 minutes. Add a little flour, one tablespoon at a time, if the dough is too sticky and clings readily to your hands. Lightly oil a large, clean bowl with cooking spray. Form dough into a ball and place it in the bowl, turning once to coat with oil. Cover bowl with plastic wrap or a clean kitchen towel. Let rise in a warm, draft-free place until doubled in volume, about 2 hours. Meanwhile, make the filling: Stir together brown sugar, granulated sugar, cinnamon, ginger, and cloves. Set aside. Line a 9x13-inch pan with parchment paper and lightly coat with cooking spray. Once the dough has risen, turn out onto a lightly floured surface and roll into a 12x20-inch rectangle. Brush all over with 3 tablespoons melted butter and sprinkle all of the sugar and spice filling over the top. Starting at one of the short edges, roll the dough into a tight log, then tightly pinch the seam to seal. Gently stretch and pat the dough log as needed so that it is roughly even in diameter and 18 inches in length. With a serrated knife, gently saw the log into 12 segments (each segment will be 1½ inches wide). Arrange the rolls in the prepared pan, cut sides up. Cover the baking dish with plastic wrap or a clean kitchen towel and let rise in a warm, draft-free place until doubled in volume, about 45 minutes. (It may take a bit longer but is worth the wait.) Alternatively, you can place the rolls in the refrigerator and let rise overnight. Place rack in center of your oven and preheat to 350°F. Bake the rolls until golden and the internal temperature reaches 185°F, 25 to 35 minutes. Check the rolls at the 20-minute mark. If browning too quickly, gently tent with foil and continue baking. For the frosting: In a medium bowl, beat together the cream cheese and powdered sugar until smooth. Add 3 tablespoons milk, vanilla, cinnamon, and cloves. Add a little additional milk as needed to reach the desired consistency. Frost rolls and serve warm. These rolls are perfect to make ahead and let rise overnight in the refrigerator. Once the rolls are shaped, arrange them in the pan, cover with plastic wrap, then let rise in the refrigerator overnight. The next morning, set the pan out at room temperature for a half hour, then bake as directed.